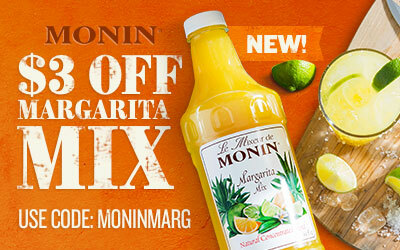 Whip up delicious frozen drinks in no time with this Monin 46 oz. mango fruit smoothie mix! This ready-to-use smoothie mix makes it incredibly easy to make premium drinks in a matter of minutes - simply pour over ice, blend until smooth, and serve! Able to stand on its own with no added flavors or mixes, this high quality smoothie mix delivers an irresistible taste that can't be beaten. A popular flavor amongst customers of all ages, upgrade your signature beverages with this mix! 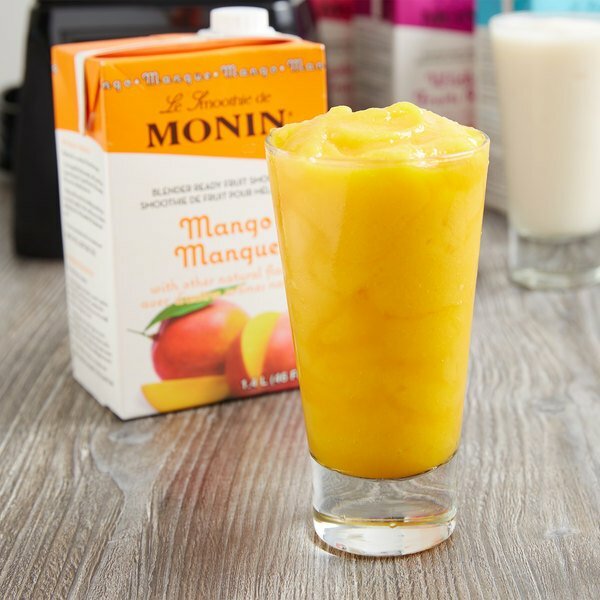 "We absolutely love using all the Monin brand smoothie mixes. The Mango smoothie mix especially is one of our favorites because it taste exactly like a Mango has been freshly cut open and then blended into a smoothie. 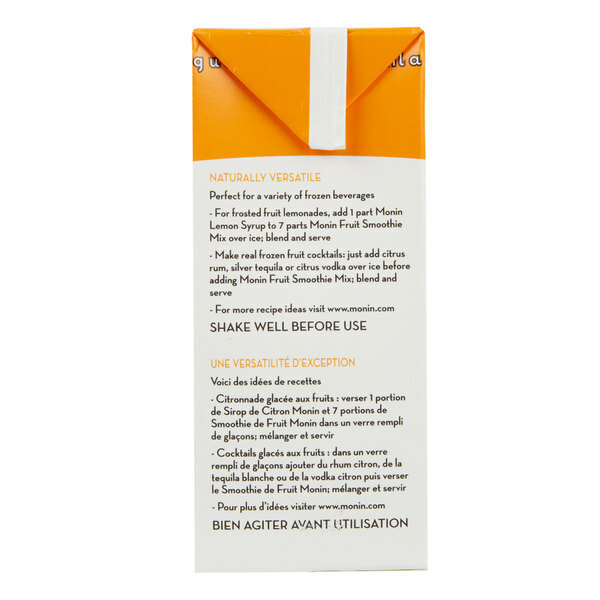 Do not even think about trying other smoothie mixes.... whether…"
Boasting a sweet, tropical mango flavor and aroma, this mango smoothie mix is made with fresh, natural ingredients, including fresh mangoes picked at the peak of ripeness, and contains no preservatives. Offer premium mango fruit smoothies, or craft popular alcoholic drinks like a frozen daiquiri or mango margarita. You can even use this mix to create milkshakes and frappes, making it an extremely profitable addition to your coffee shop, cafe, bar, or restaurant. These smoothies are fabulous. You can mix them with just ice but we add a little OJ and then we also add vanilla soft serve if they want an ice cream smoothie. Delicious! The mango flavor is really strong in a good way. You don't have to use a whole lot to get a nice fruity mango flavor. 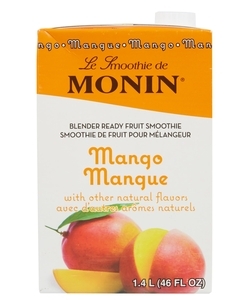 This monin smoothie mix taste amazing and natural it also has a great consistency I recommend the monin smoothies over the divinnci ones taste better and a lot thicker. Our customers love these smoothies. This mango smoothie mix tastes great. It mixes easily and doesn't have any chemical taste. It's so easy to use. I just add the syrup, a bit of water and some ice. 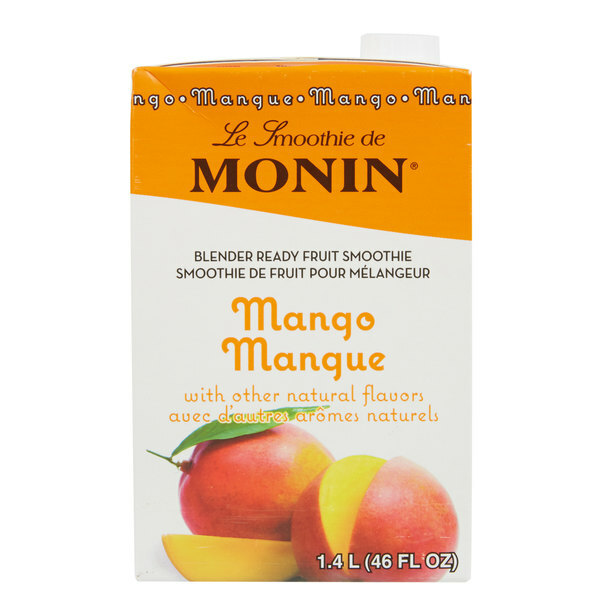 The Monin mango fruit smoothie is so amazing and has a great, strong mango flavor. So happy we added the Monin brand of mixes to our sweets shop and deli. A really tropical tasting smoothie that is bursting with the sweet flavor of mango. A great smoothie mix and also a wonderful base for frozen daiquiris. 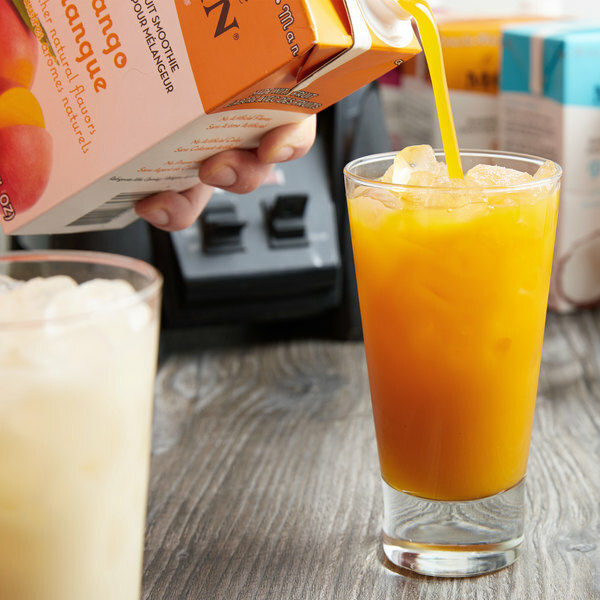 We absolutely love using all the Monin brand smoothie mixes. The Mango smoothie mix especially is one of our favorites because it taste exactly like a Mango has been freshly cut open and then blended into a smoothie. Do not even think about trying other smoothie mixes.... whether it is for you or for your restaurant, you will love these! This mix makes the best mango smoothie I've tasted. Our customers love it which is great. For the cost of it and the natural flavor, it is the best thing! 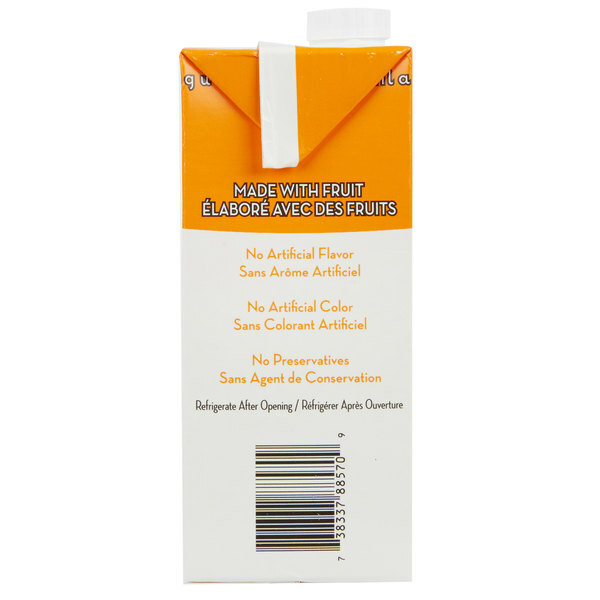 Love the mango flavor and light body of this mango fruit smoothie mix. Great to drink anytime of the day and super easy to mix up. The Monin fruit smoothie mix is so tasty. Love the fresh mango texture and flavor. So hard to beat and almost impossible to make a better tasting drink. A lovely tropical inspired mango fruit smoothie that is great for adding to our cocktails. The mango mix is thick and very rich in flavor. 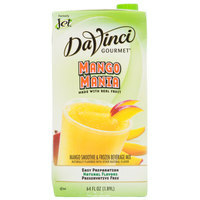 A great and refreshing mango flavored smoothie mix that has a great price point. The monin mix is well packaged and great quality. A great selling flavor. 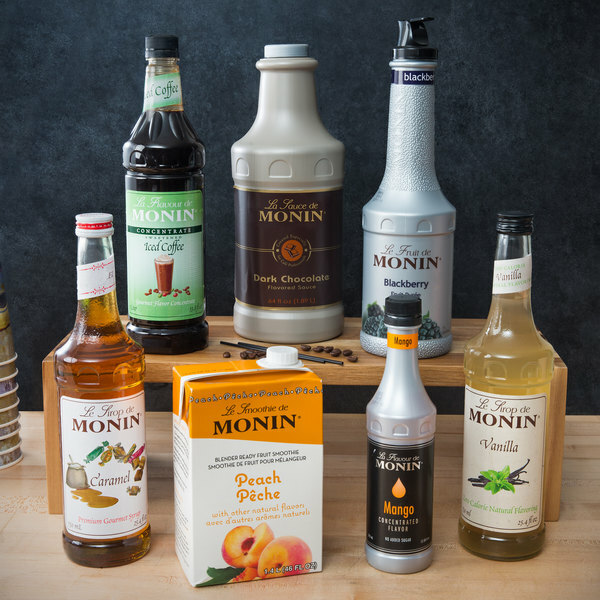 The monin mixes are the BEST value and quality around. Mango is one of the most popular and it can stand on it's own with no added flavors or mixes. Recipes true to the box. The mango smoothie mix is a fresh and great tasting smoothie mix that is so easy to create a great tasting smoothie. Just add ice and a splash of milk for a great tasting smoothie. Nice rich flavor and more fruit in it than sugar so it's a nice healthy choice. It's got a lot of vitamin A in it and it's really easy to use and can be used to add in vitamin drinks or kale powder if you want to make it even healthier! Super yummy and easy to make! One of our most popular flavors, too! We love this product, especially for the price, but we do which it had less ingredients. 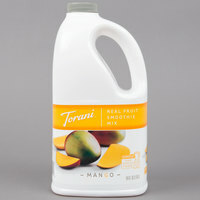 Mango smoothie mix tastes great and it's great for blending with other flavors. Great price for the amount that is received. I highly recommend for other smoothie stores.